This is my backup solution and process. I have 2 external hard drives: External Backup A and External Backup B. One is at home and one is at my parents’ house. Every Monday, I plug my local External Backup drive into my laptop and clone the laptop’s data to it. I use Carbon Copy Cloner on the Mac; you could use rsync on Linux or DriveImageXML on Windows. Most weeks, this takes less than half an hour. Whenever I visit my parents–which is every week or two–I bring my local External Backup drive, and swap it out for the one at their house. I have more data than just what’s on my laptop, though. I have movies, anime fansubs, backups of my YouTube videos, and backups of old data. That’s why I set up a 12 TB RAID 5 array connected to a Raspberry Pi running ArkOS. The RAID 5 array ensures that if any one drive in the array dies, not only does it continue to work, all the data on that drive is still available. I can even replace the drive while it’s running. Plus, it’s not 1-for-1 mirroring, so every drive I add gives me the full capacity of that drive. Explaining that set-up is a bit outside the scope of this article, but suffice to say: I have a bunch of data on a separate drive. So I have another set of external drives, which also live at my parents. Every 6 months, I bring those back with me, and run a set of scripts to backup that data, putting all my photos on one drive, all my YouTube data on another, etc. The -r option is recursive (copy folders within folders within folders), the -u option skips files that are newer on the target drive, the -v option displays each file it’s copying, the —ignore-existing option skips files that already exist on the target drive, and the –exclude option skips any hidden files on the source drive. If you want to do a dry run, which lists every file it plans to copy and a summary of the disk space required but doesn’t actually copy any data, use “-runv” instead of “-ruv”. Those drives then go back to my parents’ house. It’s hardest to see the future when the present is shifting so much. However, we can see clearly if we look at fundamentals and clearly understand the nature of change. Electronic publishing is changing that. People assume that it’s killing publishers. That’s wrong. It’s killing distributors. It’s obvious when you unpack the publication process. What do publishers do? Copyediting — Fixing typos and grammar mistakes, and re-arranging sentences so they flow better. Editing — Suggesting changes to the flow of information in the text, to improve the story’s speed, comprehension, etc. Layout — Choosing typefaces, deciding on the layout of chapter headings, etc. Cover art — Still important; books need an encapsulating image to catch a reader’s eye. Printing — Physically producing the finished books. Advertising — Buying ads in magazines and newspapers, sending review copies to reviewers, pushing on social media, etc. Broader marketing — Very different depending on the author and book, but can include arranging book tours, producing online videos, etc. Electronic publishing affects one of those seven activities (with minor effects on some others). Electronic publishing on Amazon’s Digital Text Platform, Barnes & Noble’s PubIt!, and others allow an author to bypass the publisher’s process. This does not make those steps worthless; it makes them optional. So: publishers will not be primary gatekeepers. They will still have a place. To see the future of electronic publishing, think about The New Yorker. Even in a world of free publishing, it would still mean something to be published in The New Yorker. So a publisher’s value will lie in its exclusivity and taste. People today will follow a blogger for recommendations; so will people 20 years from now follow publishers for their catalog. Let’s imagine the website for an electronic publisher named Clio, 20 years in the future. Their main page lists the titles that they have available. The first thing of note is the relatively slow publication schedule. Clio intentionally releases only a few books a month, all of very high quality. But now let’s click on their “Why Publish With Clio?” tab. We see a page explaining that Clio offers a full range of copyediting, editing, layout, artistic, and marketing services. If you submit your manuscript to Clio (right from their website, of course) you’re sent to a web page that shows your manuscript’s exact place in the review queue, and estimates the number of days until your manuscript is reviewed. If your manuscript makes it through the review process, editors and marketers will polish it (with your input and acceptance, of course). All these services will be paid back by a small commission from sales of your book; once they’re paid back, you only pay a trivial amount for ongoing hosting fees. You also select a marketing plan. You can do all the marketing yourself and pocket all the rest of your books’ profit, or you can have the publisher market for another small, ongoing commission. You can even change the marketing agreement later. It’s all do-able, and it provides all the advantages of a traditional publisher with few of the drawbacks. It not only gives publishers a place in the market, it gives them a clear place. The peerless Trey Ratcliff was kind enough to offer invites to Schemer, a new Google service, and I was lucky enough to win one. Thanks, +Trey! Jennifer Van Grove emphasized Schemer’s similarities to Foursquare in her VentureBeat article, but I see Schemer as more of a location-sensitive bucket list. 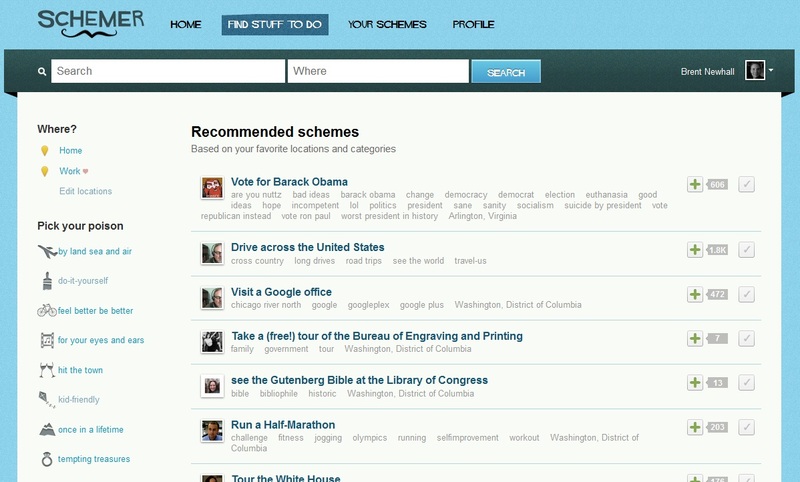 Foursquare is about visiting places; Schemer is about doing things. 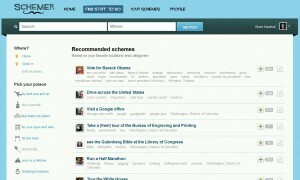 Ignoring the home dashboard, Schemer’s biggest attraction is its “Find Stuff To Do” page. Here, you’ll find a list of projects (“schemes”). All of these projects were made by (or marked by) people in your Google+ Circles, or who live or work near you. It’s not creepy; it doesn’t suggest that you do the same things as your next-door neighbors. But if you live in Seattle, most of the projects listed for you will be either based in Seattle or not location-specific (e.g., “Knit a sweater”). You can also leave comments on projects (sorry, “schemes”), and this is one of the site’s most exciting features. If it can collate advice from people who’ve already done something, it could be a powerful way to help people achieve their goals. There’s already an Android app available, with an iPhone app “coming soon.” I have no Android phone, so I can’t comment on that. So, the big question: Is Schemer worth using? As a bucket list, yes. This is a fine way of tracking larger concrete life goals. If you’d like an invite to Schemer, leave a comment and I’ll give ’em out as long as I’ve got ’em. A full decade ago, a CEO was telling me that the future was in “programming for the masses,” that certain elements of programming would get easier and easier for normal people to do. He pointed towards scheduling apps as the sorts of things that should be easily extended to this. Imagine sending out an invite with a poll of available times, then setting a time after a certain number of people voted, such that people who check later only get that time. Edit: In the original version of this post, I called this a Kindle 3. Brain fart. Sorry about that! My parents kindly bought me a Kindle 4 for Christmas. It’s the new, small, light one. No touch, no 3G. Simple. Today, I realized why I was struggling: The Kindle is designed for women’s hands.1 And those hands are typically smaller than a man’s. 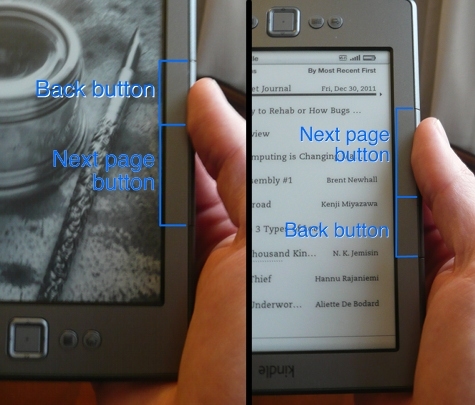 Then my mind leaped to a memory: while checking out the Kindle’s orientation options, I saw an upside-downmode. I’d wondered at the time, Why would anyone want to use a Kindle upside-down? The answer was now obvious. I set the Kindle to upside-downmode. Voila! I can now turn pages with complete ease. Success! I’ve been playing around with Diaspora*, a new social network that apparently is trying to be an “open” social network — anyone can host a Diaspora* server, for example. 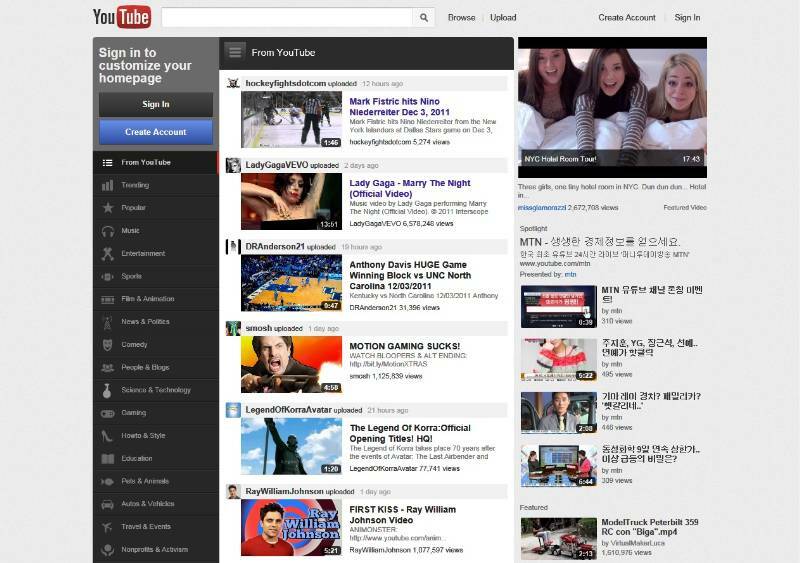 In practice, Diaspora* looks and operates so much like Google+ that I struggled to find a difference. Even Diaspora*’s aspects, which it describes as “unique,” seem to function exactly like Google+ Circles: named groups of friends. The main difference appears to be that Diaspora* automatically signs up a few people for your stream, based on the interests you specify when you first sign up for the service. There are quite a few technical glitches, too, though that’s unsurprising for a grassroots service that’s still in alpha. When I first saw this, I harrumphed. Then I took a moment to think, and remembered that I love Google+. 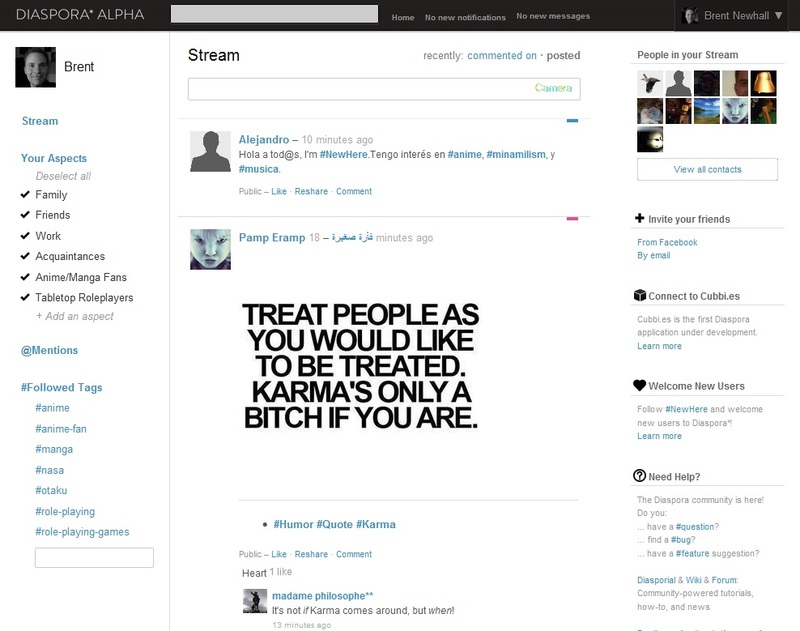 If a new social network were to imitate any existing one, I’d want it to mimic Google+. The big question is whether enough people care about the whole “Google vs. open standards” issue to use a platform that’s exactly like an existing one. Bottom line up-front: Click on the Feed tab, then below the Post a bulletin text box, click the view button and select comments only. Your channel comments now appear. For the record, I like the new design: it’s clean and mostly clear. The information is laid out in a reasonable and logical structure. I like that stats and info are near the top of the page but grayed out. I want that information to be easily available, but not distracting. Not sure why channel comments are so tucked away. Perhaps because they’re so often content-free? His final point bears repeating: on the web, the infrastructure is pretty much done. Want to create a website? You can have a slick site in an afternoon. And that’s not just one page of black text on a white background; that includes SEO and permissions and embedded videos. Nor do you have to be a techie to do this. Google any question. The answers are there. The question is: now that the tools are mature and the platforms are robust, are we putting equally mature content on them? Theree are so many sites and services out there that I feel Ike I’m always late to the party. A perfect example is GigaOm, a tech blog that I’d always ignored under the assumption that it was another Techcrunch–breathless articles about new smart phones or social networks. I then saw GigaOm’s founder on This Week in Tech, and he impressed me with his knowledge and deep thought. So I checked it out. GigaOm’s articles provide perspective. A recent article about an outsourcing service pointed out its potential applications and impacts, along with a healthy dose of skepticism about the service’s practicality. It’s exactly what I want out of a tech blog: information and analysis. Colors that clash and don’t add information. Tons of ads. And I mean multiple consecutive pages of just ads. Very few full pages of content. Many stories have a fearmongering aspect. A good example is the article on Simon Singh, who was sued about his work on pseudoscience. This is portrayed like a Worrying Threat To Science, as though religious nutjobs haven’t been doing this for decades. Lots of fluff. Snippets of trivia. 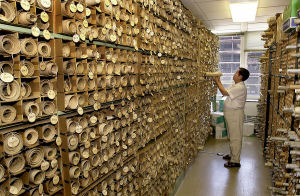 Speculation based on tiny samples of data. It’s like reading a randomly colorized Twitter feed that’s half advertisements.